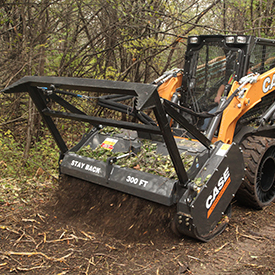 CASE has introduced an all-new mulcher-head attachment. Compatible with CASE skid steers and compact track loaders, the attachment ships standard with high flow (HF) configuration, and can be easily converted for use with enhanced high flow (EHF) hydraulics systems on 90-HP+ machines. Ideal for land clearing, site prep, right-of-way and trail maintenance applications, the mulcher features a variable two-speed motor that automatically adjusts the motor displacement to maximize rotor speed and torque to changing material loads. The new mulcher comes standard with proprietary double-carbide teeth and a severe-duty body construction for enhanced durability in tough applications.